B.B. King Museum and Delta Interpretive Center hosts the 38th Annual B.B. King Homecoming at Fletcher Park in Indianola, Mississippi. “I always idolized B.B. King, and I’ve always been a blues player, ever since I picked up the guitar...” - Tito Jackson. The annual B.B. King Homecoming Festival will return this year to Fletcher Park in Indianola while work continues on an expansion of the museum that bears King’s name. Featured at this year’s festival on June 2nd will be Tito Jackson and the B.B. King Blues Band. Jackson, well known for his role with the Jackson 5 and The Jacksons, teamed up with the B.B. King Blues Band in 2017 to become their new lead singer. The band is comprised of many of King’s former band members who still perform together, so event goers will likely see familiar faces. This will be the 38th year for the event, which for most of its years featured its namesake, Mississippi Delta native B.B. King. As long as he was physically able, King returned every year since its inception in 1983. B.B. King Museum Executive Director Malika Polk-Lee said, “Although B.B. performed in sold-out venues all over the world, nothing made him happier than to be back in his hometown to play this concert for the crowd he considered as his extended family.” The concert was held in Fletcher Park for most of those years, but was moved in 2012 to the grounds of the museum, four years after it opened. Advance tickets are $10.00 and go on sale April 1, and tickets at the gate are $15. Activities begin at noon with food and art vendors in the park, and musical entertainment will begin at 2 p.m. Tito Jackson and the B.B. King Blues Band will take the stage at 8 p.m. In 2017 Jackson released his first solo album, Tito Time, featuring “One Way Street” and “When the Magic Happens” with Jocelyn Brown, and “Get It Baby,” with Big Daddy Kane. “I always idolized B.B. King, and I’ve always been a blues player, ever since I picked up the guitar, I guess,” said Jackson. According to Ms. Polk-Lee, other acts will be announced in the coming weeks, so people are encouraged to check the museum’s website for those updates. Tito and the Band will close out the day with a show at historic Club Ebony, following the tradition of King who made this a hot-ticket event by performing at the club at the end of the festival. King always took his time to greet his fans, so there never was an official starting time for the show, and it was sometimes close to midnight when it got started. This year’s show is planned to begin around 10 p.m., and tickets are available through the museum (662-887-9539 or bbkingmuseum.org.) Food and beverages will be available for purchase on site. 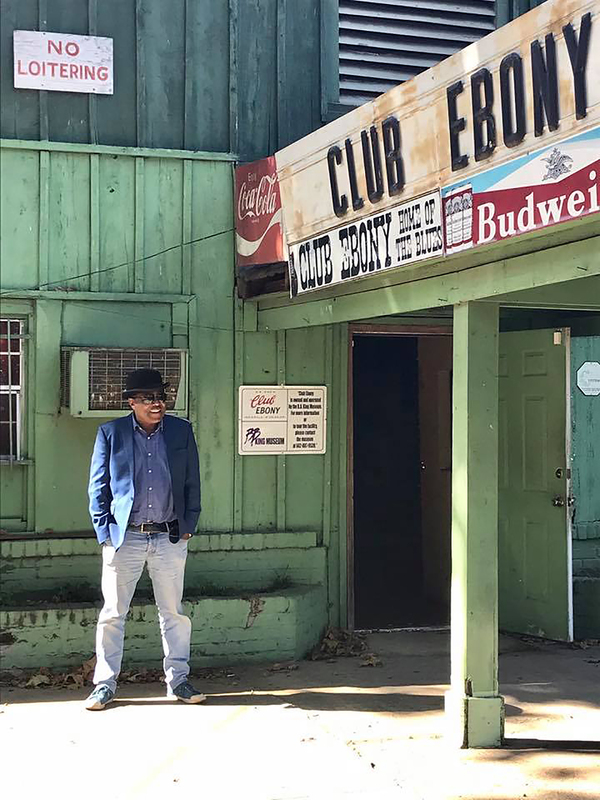 Club Ebony, which opened in 1948, was the site of performances in its heyday by big names such as Count Basie, Ray Charles, Bobby Bland, Albert King, Ike Turner, James Brown, and many more. After Mary Shepard, one of Club Ebony’s last owners, retired in 2008, King bought it and gifted the club to the museum to help preserve its important legacy. “We encourage all to visit the B.B. King Museum and Delta Interpretive Center while they are in Indianola,” said Ms. Polk-Lee. “Everyone who does comes out with a whole new understanding of who B.B. really was, the things that were important to him, and the circumstances that shaped his life,” she added. The ongoing museum expansion includes space for three of King’s vehicles: a 1978 Rolls Royce, 1984 El Camino, and one of his tour buses. It will also add exhibits for telling the story of the last years of King’s life. In addition, the museum site is also his final resting place, and fundraising efforts are in place to finalize the memorial courtyard. “We’re excited with the progress taking place at the Museum, and we hope everyone will take advantage of this chance to visit our exhibits while in town for the festival as well as pay their respects to our beloved B.B. before going to Club Ebony for what promises to be an outstanding show,” said Polk-Lee.